Run/Stop and Export button: The “Run/Stop” button is used to start and stop measurements. With the “Export” button you can select in which format you want to download the measured data (plotted spectrum). Two formats are available: .png and .csv. Inputs / Cursors / Range / Axis control panel: This menu provides controls for inputs, cursors, and frequency range settings. Horizontal +/- buttons are used to select the span of the X (frequency) axis (zooming in/out). The vertical +/- buttons change the Y (amplitude)-axis range. 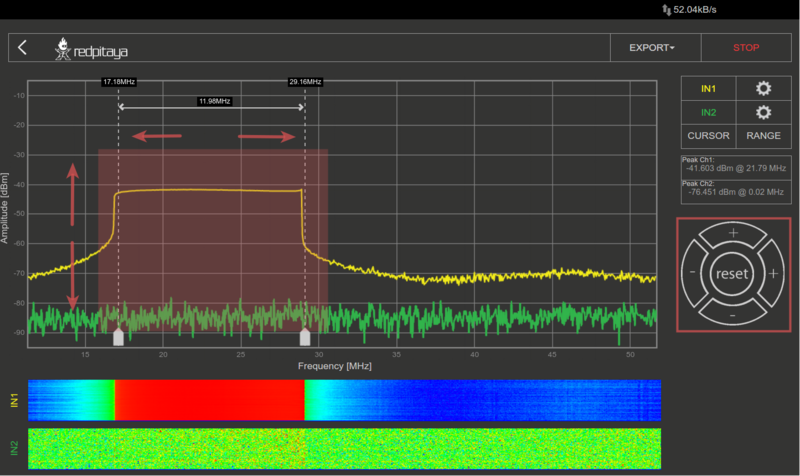 Graph area: Here, the currently calculated signal spectrum is plotted in the selected frequency range. Waterfall plots: Waterfall plots are a different way of the signal spectrum representation where the color on the plot defines the signal amplitude for a certain frequency. The waterfall plot is also useful to enable the representation of a signal spectrum in a time dependency. Inputs controls are shown in the picture below. With the “SHOW” select button displaying the spectrum of the selected input can be enabled or disabled. The “FREEZE” button is used for stopping the measurements of the selected input. The “MIN” and “MAX” select buttons are used to enable/disable the persist mode for the spectrum plot. 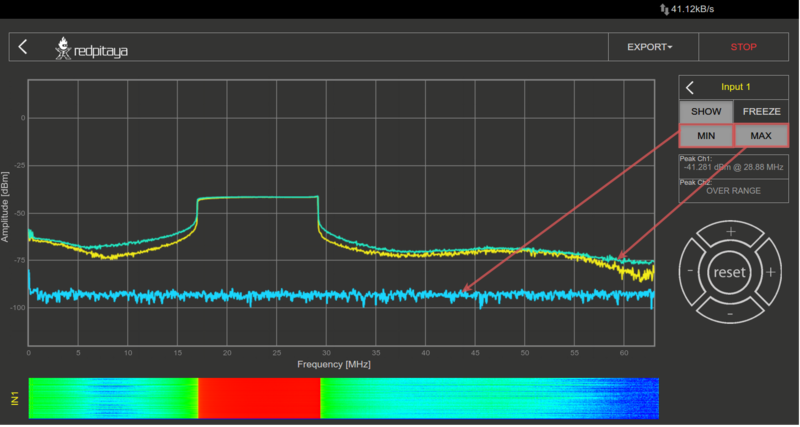 The “MIN” signal spectrum plot will show the lowest values of the signal spectrum taken after enabling the “MIN” button. The same logic is used for the “MAX” signal where the MAX values of the signal spectrum are shown. 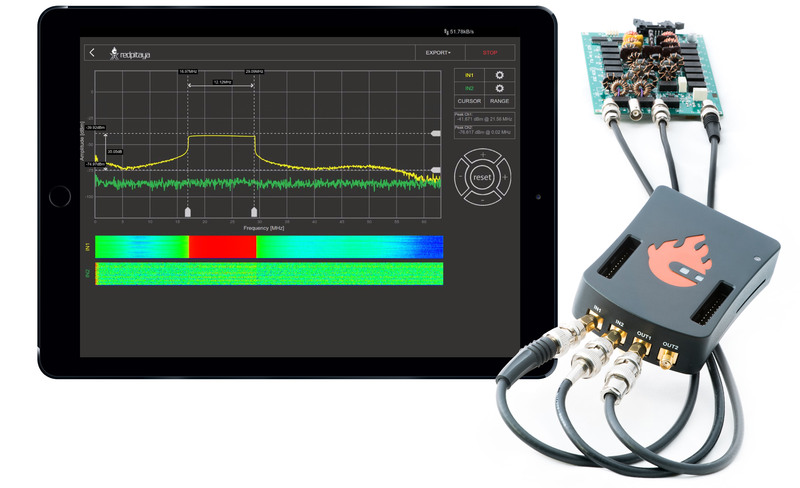 This feature is mostly used for detecting signal glitches and the max/min spectrum amplitude values during the measurement. The cursors are an additional vertical and horizontal pair of lines useful for extracting the values of the spectrum plots. 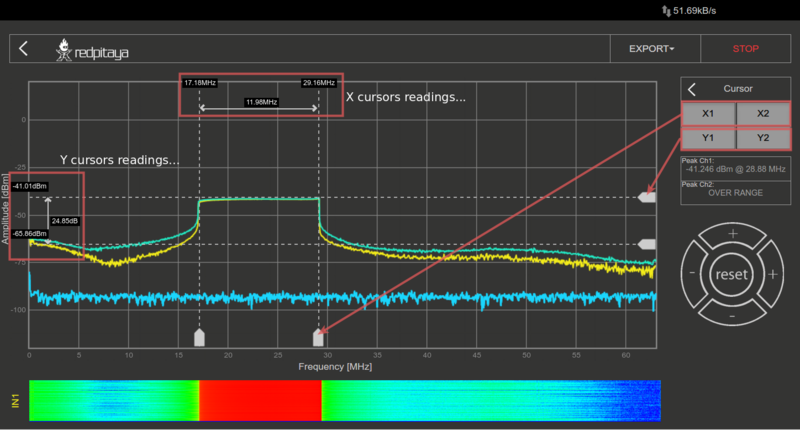 The cursors are interactive and they can be set on any part of the graph while the frequency value is shown corresponding to the place where the X cursors are set, and the amplitude value where the Y cursors are set. 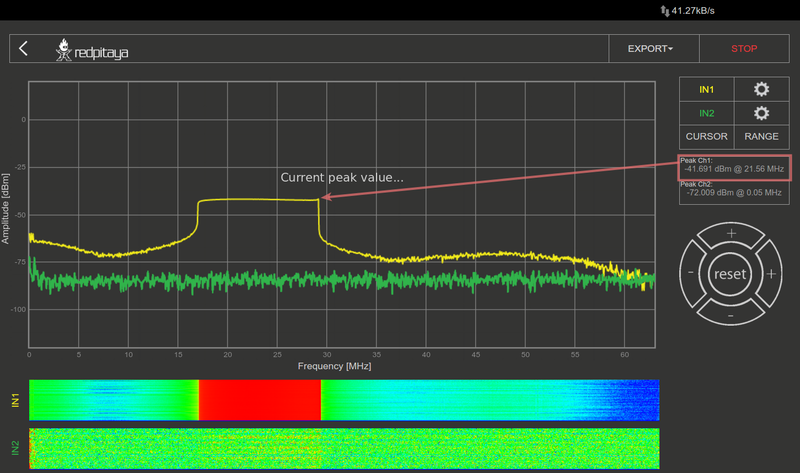 Cursor delta values are useful for measuring signal harmonics and relative ratios between amplitudes and frequencies. The range settings are used to set a frequency span. 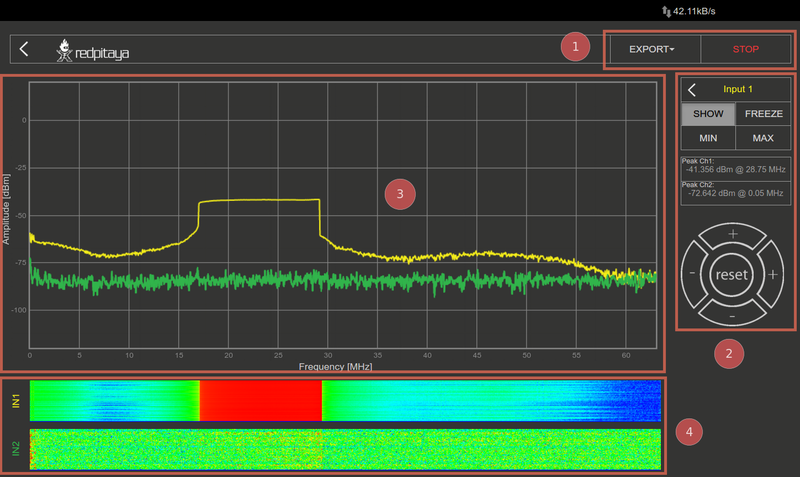 This feature is useful when the frequency range of interest is smaller than the full frequency range of the Spectrum analyzer application. 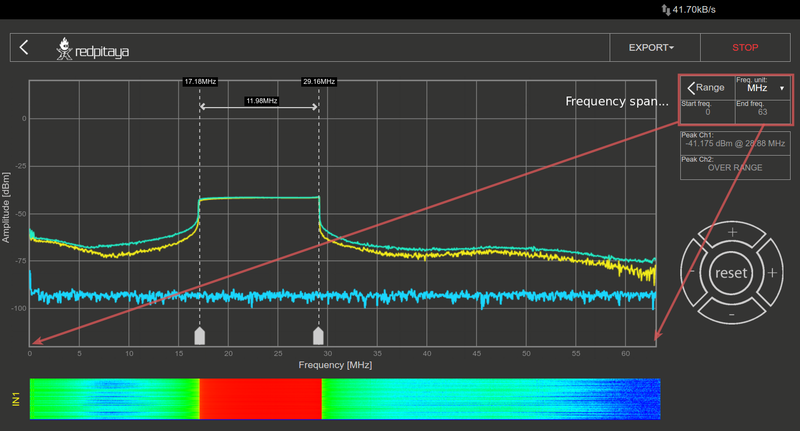 During the measurement, peak values of the signal spectrum are measured and shown on the “Peak Values” field. Peak values are max values of the signals spectrum regardless of the selected frequency range. This peak finding prevents not seeing peak values which are outside the selected frequency span. Waterfall plots are a different way of the signal spectrum representation where the color on the plot defines the signal amplitude for a certain frequency. The waterfall plot is also useful when enabling the representation of the signal spectrum in a time dependency. Horizontal +/- buttons are used to select the span of the X (frequency) axis (zooming in/out). The vertical +/- buttons change the Y (amplitude)-axis range. Reset button when selected reset frequency and amplitude span do default values.